This is excerpted from No Man’s Land, a print magazine, podcast and brainchild of The Wing, a network of work and community spaces designed for women, with stories rolling out exclusively on the Cut. The first time I saw a work by Genesis Belanger I wanted to go over and squeeze it, despite the implicit invisible social contract between viewer and artwork to please, do not touch. In Belanger’s work, sharp tongues extend out from lipstick tubes and lighters. Cigarettes crawl like cartoon millipedes, while disembodied fingers reach through the surface of a paper-wrapped flower bouquet. A wooden-heeled clog, adorned with a decorative pom-pom, grins a toothsome smile. Oversized pills the length of a pinky finger look cute, rather than lifted from the cover of a first-edition copy of Valley of the Dolls. In slightly desaturated shades of confection-colored pastels, these objets have a fluid, taffy-soft tactility that is inviting but leaves a sinister sweetness in your throat. I had the unsettling feeling that her work could come to life at any moment. The uncanniness is by design. 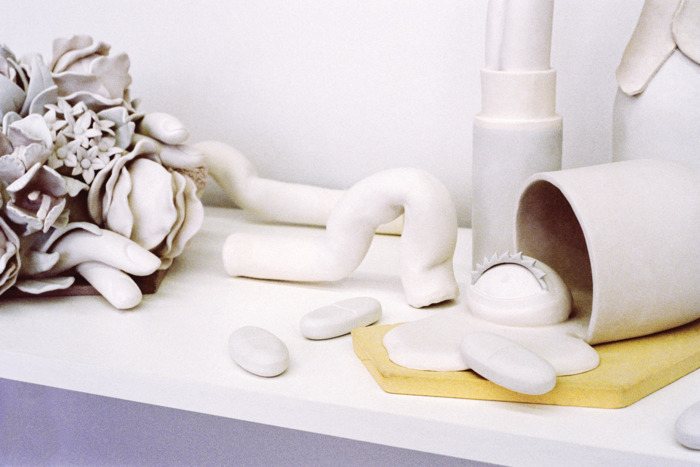 For the past three years, the New York–based artist has sculpted a continuing series of sly, surrealism-injected consumables out of porcelain and clay that read as critical case studies for the feminine experience and how it has been bought and sold. 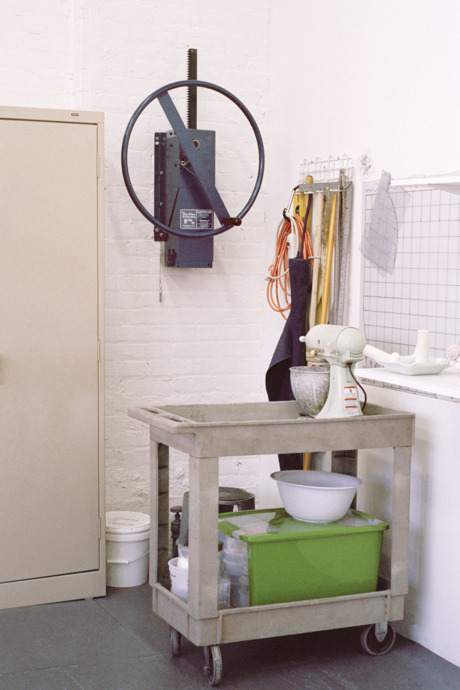 Belanger’s studio, located on the fourth floor of a building on a industrial strip wedged between McCarren Park and the Brooklyn-Queens Expressway, in Williamsburg, Brooklyn, is clean, bright, and meticulously organized. A kiln sits in the corner like an engine at rest. She shows me a piece that will be exhibited at Galerie Perrotin on the Lower East Side — a vanity strewn with ceramic renderings of an ashtray, a cosmetics compact, nail polish, perfume, a bottle of popped Champagne stuffed with a limp hot dog, and a sentient ice cube of an eyeball spilling out of a knocked-over glass. 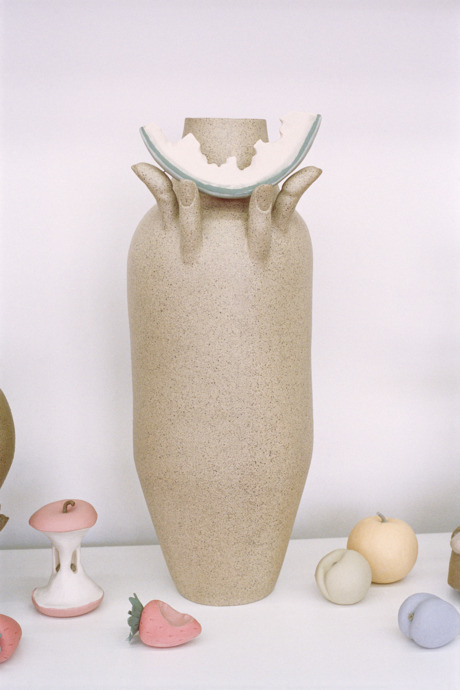 The installation “Genesis Belanger: Holding Pattern” will be on view at the New Museum until April 14.